Am sitting at the Crowne Plaza hotel in Helsinki writing this post. We just arrived in Helsinki and met with the fourth member of our gang (Scott), who was flying in from China to join us in our trip to the Lapland. This Saturday and Sunday was spent in Tallinn old town in Estonia. The trip to Estonia was one of the spur of the moment decision as we had 2 days in our hands in Helsinki before our friend would meet us. It was a decision well worth the time and effort. There are a number of ferries between Helsinki and Tallinn and it takes about 2 hrs to get to the town. We had booked ourselves in a hotel in the old town area in Tallinn which feels like nothing’s changed since the middle ages. Buildings over 500 years are plenty in this town and the neon lights and souvenir shops gives it away, as modern life exists in this middle age town. We stayed in a boutique hotel called St. Petersbourg, bang in the middle of the downtown in the old town. Sitting in a cafe that’s housed in a 700 years old tower it was eerie yet exciting. People were quite curious to see us; probably not may from Asia travel to these places or it was just plain curiosity to see a bunch of Indian guys in the middle of winter wandering around as tourists. Earlier on Saturday, having nothing planned to do for the day, we rented a tiny Toyota car and decided to just drive with no destination in mind. Turns out that we drove north east of Estonia to a place called Jagala where in the 1980s they discovered one of the oldest graves dating around 3000 BC. There was a tiny museum with the unearthed artifacts on display. Having indulged in some Estonian history, we learnt that there was a waterfall nearby that place and one of the popular tourist destinations in the summer time. We are not the ones to miss a chance to see a water fall and we quickly took directions and were on our way. 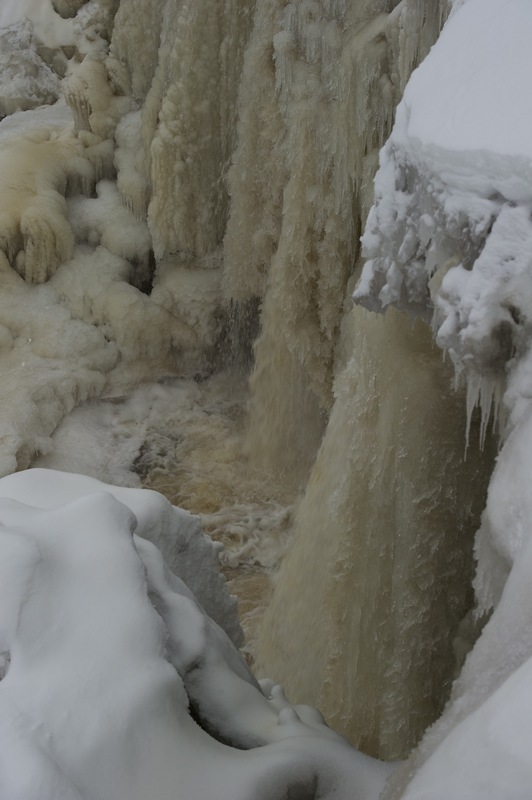 This water fall called Jagala Juga is the highest waterfall in Estonia. At 8 meters, it was definitely worth the visit. The waterfall was almost frozen save for a small stream trickling down. 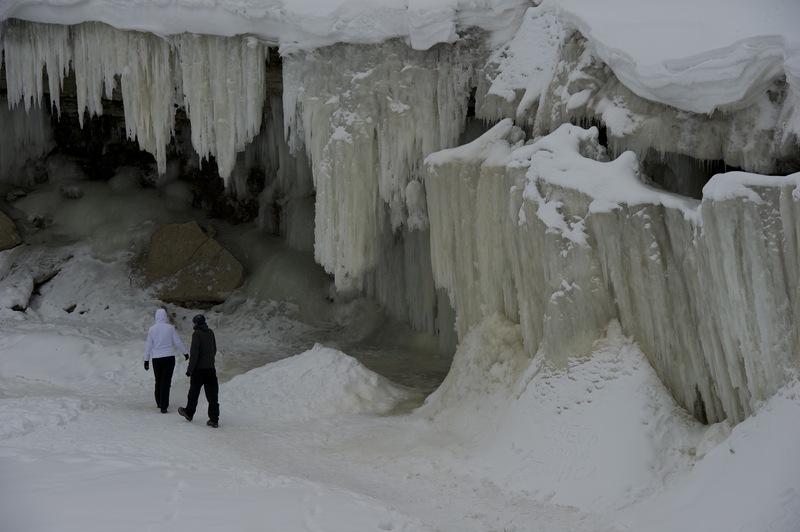 We managed to walk, slip and slide close to the frozen waterfall and spent some time exploring the stalagmite like formation of the frozen water. @Nat was not too keen to go down the path and he was looking for some locations to shoot the scenery. The person, from whom we rented the car, suggested that we visit a popular manor and marked the location in the GPS. The way we were driving on impulse, the GPS was constantly showing us the new route to the destination and we decided anyway to go there. It happens to be about 70 Kms north east of Tallinn and by the time we reached the place it was getting dark and started to snow. 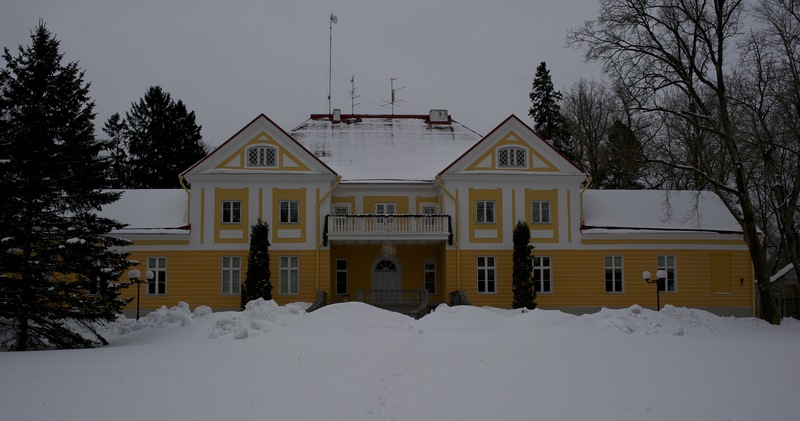 It so happens that Estonia has over 1300 such manors all over the country. It was in fashion to build these in the 17th – 19th century by wealthy individuals to be used as summer houses. Today they are tourist attractions and serves as a source of income to many small establishments in and around that area. It was quite dark by then and we decided to stop for a quick bite at a nearby restaurant. We had excellent food prepared by a German guy. His restaurant was called The Coffee Pot in the Land of Bays (the English version of his Estonian name). It was a pleasant experience to find vegetarian food in almost all of the restaurants we’ve had food so far. We finally reached the hotel at around 6 in the evening, returned the car and started to explore the old town on foot till late into the night.